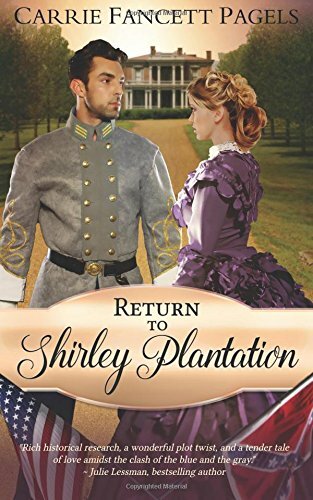 Return To Shirley Plantation by Carrie Fancett Pagels is a Christian historical novella set in 1862 during the American Civil War. There are several themes within the novella including that of trusting in God and in His timing. Angelina, a free slave trusts God. She listened to His whispers. She could have gone North but obeyed God and stayed put. It is always important to obey when one hears His voice. Carrie Fancett Pagels has delightfully drawn Angelina’s niece and nephew. As a reader I could ‘see’ them clearly. They reminded me of the children in the 1942 film Holiday Inn. War is always futile but civil war seems even more of a waste. So many men get injured or lose their lives. There are no winners in war. It seems like all families are affected. The burden to cope falls on the women. Carrie Fancett Pagels has drawn strong women who have to keep Shirley Plantation going. They also have to face the soldiers who take over their home. The women must be resourceful and stick together in order to survive. The theme of slavery is present in the novel. Slavery is wrong. God created all men free. Many characters in the novel believe in the emancipation of slaves. 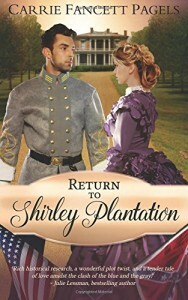 I enjoyed Return To Shirley Plantation, learning about the civil war as I relaxed on my sofa. The characters were well drawn and I could empathise with Angelina. I always enjoy Carrie Fancett Pagels stories and urge you to download one today. Thanks so much, Julia, for your lovely review. I love reading your British spellings, that makes me smile (like empathise) and it makes me wish I could have known my first generation (English-American) grandfather but that wasn’t to be. The Civil War is a horrific part of our history and no matter what the revisionists want to say about it, for the people it was ultimately about freedom from slavery in our country. Blessings!